Maps reproduced from the Atlas of Norfolk County, published in 1876 by Comstock & Cline. 74 Items. Showing Items 1 thru 50. MAN013 1876 MAP of Highlandville, Massachusetts (MA). MAN014 1876 MAP of Needham, Massachusetts (MA) (includes present -day town of Wellesley). MAN016 1876 MAP of Wellesley village, Massachusetts (MA). MAN017 1876 MAP of Grantville and Charles River Village, Massachusetts (MA). MAN018 1876 MAP of Needham Centre, Massachusetts (MA). MAN020 1876 MAP of Enlarged section of Needham and Lower Falls, Massachusetts (MA). This historical old Dedham map was reproduced from the 1876 Atlas of Norfolk County by Comstock & Cline. About Westwood: It was first settled in 1640 and was part of the town of Dedham (it was originally called West Dedham) until it was officially incorporated in 1897. It was the last town to split from the original town of Dedham. MAN022 1876 MAP of Dedham Centre, Massachusetts (MA). MAN024 1876 MAP of Enlarged section of Dedham Centre, Massachusetts (MA). MAN027 1876 MAP of East Dedham Centre, Massachusetts (MA). MAN029 1876 MAP of Hyde Park, Massachusetts (MA). MAN030 1876 MAP of Central section of Hyde Park. MAN032 1876 MAP of Northern section of Hyde Park, Massachusetts (MA). MAN034 1876 MAP of Southern section of Hyde Park. MAN037 1876 MAP of Ridge Hill Farms (Wellesley). MAN038 1876 MAP of Milton, Massachusetts (MA). MAN040 1876 MAP of East Milton, Massachusetts (MA). MAN041 1876 MAP of Medway Centre, Massachusetts (MA). MAN042 1876 MAP of Lower Mills, Massachusetts (MA) (Milton). MAN044 1876 MAP of Medway, Massachusetts (MA), (includes present-day Millis); insets of East Medway and Rockville. Reproduced from the 1876 Atlas of Norfolk County by Comstock & Cline. About Millis: "This town was formed from the eastern part of medway, and incorporated February 24, 1885. The water and air are excellent and the town is regarded as unusually favorable to health." (Quote from The Gazetteer of Massachusetts, published in 1890 by the Rev. Elias Nason, M.A. MAN045 1876 MAP of West Medway, Massachusetts (MA). MAN047 1876 MAP of Quincy, Massachusetts (MA). MAN048 1876 MAP of Dover, Massachusetts (MA). MAN050 1876 MAP of Quincy, Northern section of center, Massachusetts (MA). MAN054 1876 MAP of Quincy, Southern section of center, Massachusetts (MA). MAN057 1876 MAP of Quincy Point, Massachusetts (MA). MAN058 1876 MAP of Atlantic (Quincy), and part of Wollaston, Massachusetts (MA). MAN059 1876 MAP of Wollaston, Massachusetts (MA). MAN060 1876 MAP of Medfield, Massachusetts (MA). MAN061 1876 MAP of Medfield Centre, Massachusetts (MA). MAN062 1876 MAP of West Quincy; Portion of Jerusalem-Road (Cohasset). 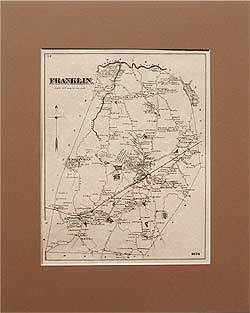 MAN064 1876 MAP of Franklin, Massachusetts (MA). MAN065 1876 MAP of Franklin Centre, Massachusetts (MA). MAN066 1876 MAP of Weymouth, Massachusetts (MA). MAN068 1876 MAP of North Weymouth village, Massachusetts (MA). MAN070 1876 MAP of Weymouth Landing, Massachusetts (MA). MAN074 1876 MAP of East Braintree and Weymouth Centres, Massachusetts (MA). MAN077 1876 MAP of Lovells Corners, East Foxborough, North Weymouth Station, Massachusetts (MA). MAN078 1876 MAP of East Weymouth Centre, Massachusetts (MA). MAN081 1876 MAP of Foxborough Centre, Massachusetts (MA). MAN082 1876 MAP of South Weymouth Centre, Massachusetts (MA). MAN084 1876 MAP of Town of Holbrook; inset of Brookville. MAN085 1876 MAP of Norwood, Massachusetts (MA). MAN086 1876 MAP of Norwood Centre, Massachusetts (MA). MAN088 1876 MAP of Holbrook Centre, Massachusetts (MA). MAN089 1876 MAP of Canton, Massachusetts (MA). MAN090 1876 MAP of Canton Centre, Massachusetts (MA). MAN092 1876 MAP of Springdale Station, Ponkapoag, Canton Corner. MAN093 1876 MAP of Randolph, Massachusetts (MA).